The future isn’t set in stone and we can all influence it and make choices that take those baby-steps (because, yes, change can be very slow) towards a better future for all of us. However, it can be very difficult to see what those steps can be. I believe that for a sustainable fashion future, the fashion experience is at the core of the issue and within that, especially the way the fashion industry is currently set up, the consumer experience, and within my research, I, therefore, ask what this future experience can be. 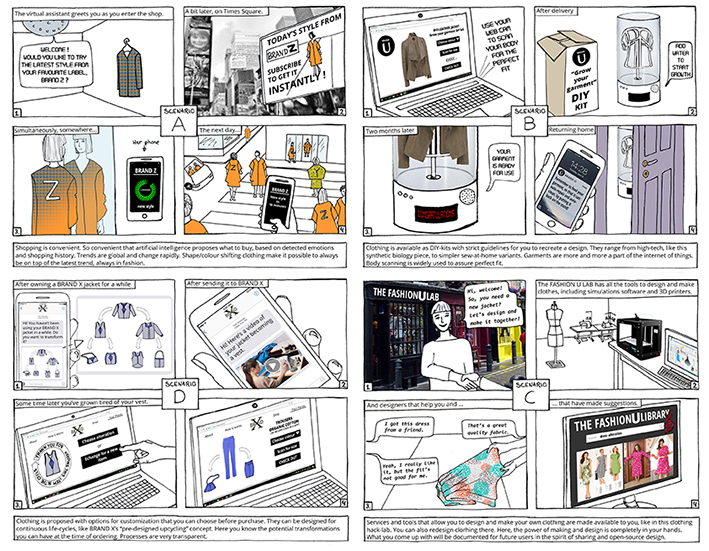 Furthermore, I wanted people’s opinions on them, therefore I visualised the four experiences, A, B and C, that I had designed and presented them in The Future Fashion Consumer Survey. Now, we all have busy lives and a myriad of different interests and things we find important. Therefore, Ezio Manzini (2015, p. 105) stresses the importance of allowing people to choose how involved they want to/can be in a given situation, and also presenting them with the choice of “joining in ‘lightly’ “. The consumer experiences were therefore designed with different approaches to and levels of consumer engagement in design and making. The survey collected a total of 384 responses from all over the world, overall genders and ages from 17 to 60, but with a large majority from Norway, my native country, so this came as no surprise. The other two countries with larger groups of respondents were Romania and the UK. Overall, the results were rich, much richer than what I could ever hope to exploit within this research. The questions of which experiences people would prefer/be open to or that would be most meaningful to consumers are of particular interest to me and designers if we want to address over-consumption and create a more sustainable fashion industry. The results showed a general inclination towards the scenarios with more involvement (B, C and D – see scenrio drawings above) and the scenario where the consumer makes their garment together with the designer, from a-z, in a fashion maker space, got the highest score. This does not necessarily mean that it’s realistic that people will make all their clothing, or would even want to, but it shows that there is scope for the fashion experience to be so much more than the current shopping experience allows. Furthermore, the people preferring the same scenario shared many of the same reasons for their preference, and as such, consumer profiles emerged. These reasons were connected to values concerning human connection, taking care of belongings and the environment, as well as the person’s relationship with technology and with fashion and creativity. These are elements that are important to take into consideration when designing the future fashion experience and can form the basis of a more human-centred approach to fashion design, where the users’ thoughts and feelings confront pure commercial goals. These preferences varied little between participants of different nationalities or between the youngest and the oldest millennial women surveyed, but the consumer habits did and among the most striking differences was that Romanians were the only group where no participant stated that they never repaired their clothing! Within my research, the survey results informed a workshop with designers, aiming to question their role and their way of working and this is but a brief overview of some of the thoughts sparked by them. I’d like to thank all participants that made this research possible and I hope that together, we can slowly make a difference! Manzini, E. (2015) Design, when everybody designs: An introduction to design for social innovation. Cambridge : MIT Press.